Children color the picture and glue the words in the correct box. They can also glue on a felt heart or happy face sticker over the heart in the picture. 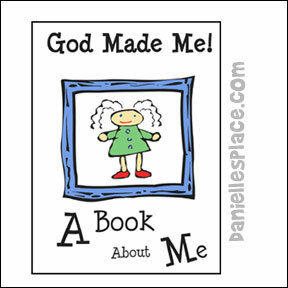 Children make one or two pages of the God Made Me Book for each lesson. 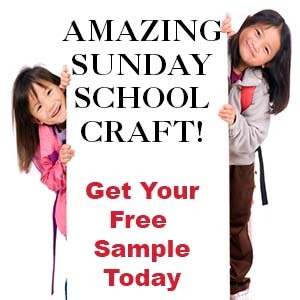 Cover- Children can draw a picture of themselves or glue a photograph on the cover. Page 1 - "I Can Write My Name" - Children practice printing their name. The teacher helps them fill in a chart about what they can do, how many brothers and sisters they have, how many pets they have, etc. Page 2- My Wonderful Eyes - Children draw pictures of wonderful things they can see that God has made. Page 3 - My Eyes Are This color - Children color pictures of eyes to match their own eye colors and then work on a chart that shows how many children in their class have each eye color. Page 4 - My Listening Ears - Children draw pictures of things they can hear. Page 5 - My Beautiful Feet - Children trace their feet when many different colors of crayons. Page 6 - Good Things I Can do With My Feet - The teacher helps children fill out a chart that shows what each child can do with their feet. Children draw pictures with their feet. Page 7 - My Helping Hands - Children make a handprint. Page 8- Good Things I Can Do With My Hands - The teacher helps children fill out a chart that shows what they can do with their hands. Children draw pictures. Page 9 - Good Things I Can Do With My Mouth - The teacher helps children fill out a chart that shows what they can do with their mouths. Children count their teeth and draw that number of teeth on a picture of a mouth. Page 10 - My Happy Hearts - Children cut out heart shapes and glue them on the page. They draw happy faces on the hearts. The patterns are available in both KJV and NIV and in Color and Black and White. 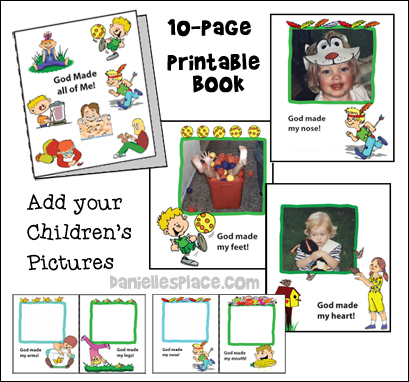 God Made All of Me Printable Book - Add Your Own Photographs! Your children will love seeing pictures of themselves in this printable book, and will want to read it over and over. You can take pictures in class or have parents bring in pictures of their children to include in the book. The window for the photograph is cut out and the pictures are taped to the back of the page. The pages can be laminated to make the book more durable. *Note - Always get permission from parents before taking pictures of their children. 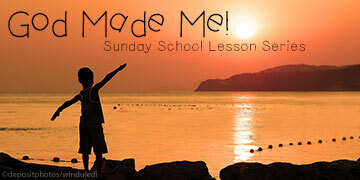 Lesson 1 - God Made Me! 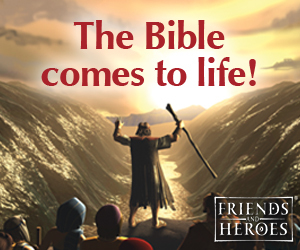 In the first lesson in this series your children will learn that God created everything, but he created man in a very special way. He breathed his very breath into him and gave him life. His breath flows through us today through his Holy Spirit. God gives us life and he wants us to be happy and live our life for him. 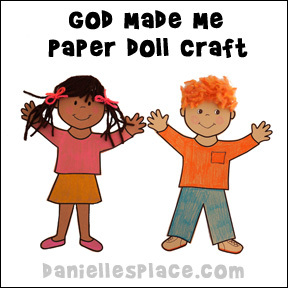 Children will enjoy making these paper dolls to resemble themselves. Children use templates to trace the basic clothes shapes onto construction paper that matches the color of their clothes. They draw in the face and add hair that match the color of their own hair. 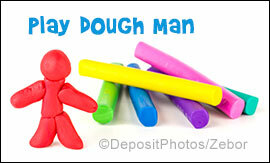 Have your students make a men shapes from play dough. Explain to them that God spoke everything into existence except for man. He created man by forming the dust into a man shape and then breathing the breath of life into him. Before class tape big pieces of butcher paper (paper used to cover bulletin boards) about 2 feet wide, one next to the other, on the wall. Write the memory verse on each sheet of paper. Have each child stand in front of the paper and outline his or her body onto the paper and then let them color it. When they are finished, roll them up, and tape them closed so they can take them home. If you have children in your class who are beginning to read, you can also have these children label the different body parts on their pictures. 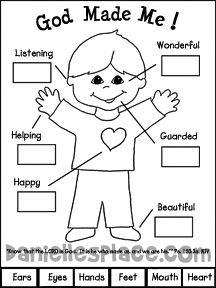 Write the different body parts on labels and then have the children place the appropriate label on each body part. Use words such as: head, hand, mouth, nose, ear, foot, etc. This is a coloring page and printable book all in one. Children color the picture, cut around the child's hands and glue the mini book under the child's hands. God made my ears so I can hear bees buzzing and sheep that baa. God made my eyes so I can see birds flying and rainbows. God made my skin so I can feel the sun on my face and a cat's soft fur. God made my nose so I can smell flowers and popcorn popping. He made my mouth so I can sing praises to him. ©2007, Digital by Design, Inc. - See Copyright Information Do not publish this story on another web site or blog. Arrange the chairs like you would if you were going to play musical chairs. Set up chairs so that you have one less chair than you do children. Play some music and then stop the music. The child who is left standing has to answer a question from the lesson. For example, you can have them repeat the Bible verse, or you can ask them to tell you an example of a large animal that God created, or a small animal, or a slow animal. Slap your thighs and clap your hands as you sing it. God made everything and God made me. God made everything and God made Dustin. God made everything, and God made me a helper. Do not publish this story on another web site or blog. (Numbers) Before class write the numbers your children are studying on separate sheets of paper. Divide your children up into groups of two. Give each group a piece of paper with a number written on it. Tell your children not to let anyone know what is written on the paper. Pick one group to go first. They should use their whole bodies to form the number written on their piece of paper. See if the other students can guess what number they are forming. Let each group take a turn. When everyone has had a turn make a comment about how wonderful our bodies are. We can do so many wonderful things with our bodies. (Shapes) Divide your children up into groups of three or four. Tell them that they are going to play a game to see which team can form their bodies into different shapes first. When you call out a shape the children in each team should try to form their bodies into that shape using as many teammates as possible.